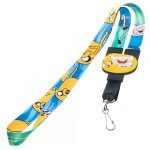 Do you love to wear tank tops in the summer and love the television show Adventure Time? Well, if so this pink Adventure Time tank top will be perfect for you to wear on a hot summer day. 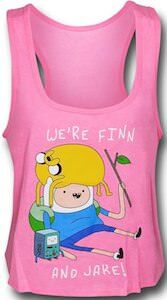 This cool Adventure Time tank top features a picture of Finn sitting down holding a stick with his best friend Jake lying on his head and BMO is sitting down next to Finn on the front of the tank top. Also written on the front of the top is We’re Finn and Jake! This women’s tank top is made from 50% cotton 50% polyester and comes in a wide variety of sizes from Small to XL. Finn And Jake might take you on one of there crazy adventures when you slip into this Adventure Time Tank Top.